Ready Made Rigs There are 11 products. 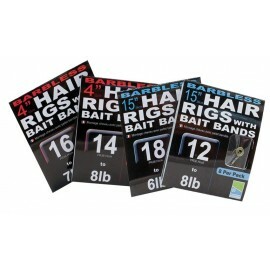 These hooks are perfectly for maggot fishing as well as a wider range of pellet and paste baits for whenever a light but strong hook is required. Light and strong the Carbon Feeder is ideal when feeder fishing bigger and combination baits for bream, tench and carp. The special swept crystal bend and extra forging make these hooks versatile and lighweight. The long inclined point makes it suitable for use with a range of baits including maggot, caster, bread punch, worm and hemp. A flat forged, eyed, barbless hook ideal for feeder, pole or waggler fishing for bigger fish. Eyed, barbless ready tied rigs using: carp match hooks, blowback silicone rig to clear nylon. Ideal for commercial carp waters. Drennan Eyed Barbless Carp Method Hooks are a double extra strong pattern using the same proven shape as the Drennan Barbless Carp Feeder. It's perfect for no-knot hair rigs and and when fishing the method its special bend definitely helps to hook and land more carp. As it's name implies the red colour of this hook makes it ideal for use with red maggot and pinkies, caster and worm. Extremely strong, Super Spades are capable of landing seriously big fish, including chub and barbel on the rivers and tench, carp and bream on stillwaters. Each hook to nylon is carefully tied by hand and is subject to a rigorous individual inspection procedure to achieve a perfect product that can be relied upon every time. All the packs have 8 snelled hooks per card.